Are you a person who loves to be pampered? Who doesn't love the idea of enjoying a daily massage or take a bath in rose petals? If you do, then why not book a package that already includes some wellness treatments - and take advantage of the special prices. Our top family offer for all ages! Snow, fun and action for the little ones, and pure relaxation for their parents. 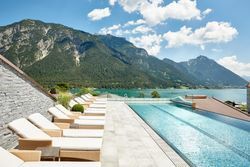 During our family hit weeks children under the age of 4 stay for FREE, while those aged 4 to 9 pay the special price of just € 20 per child per day when staying in their parents' room (with 2 full-paying adults) including Karwendel's comfort board for kids.